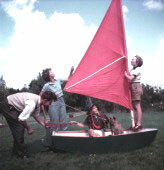 Mariner Sailmakers first hit the Dallas sailing scene January 1st, 1975. And what started out as a small custom sail loft has evolved into one of North Texas' top rated active watersports suppliers. In 1988, Mariner Sailmakers branched out with a Windsurfing and Sailing Accessory Store, and within one year added Hobie Cat products to the growing sail shop. In 1990 Mariner Sails, Inc. became a separate company dedicated to serving local sailors with high quality sailing equipment and service, while Mariner Sailmakers continued to provide high quality custom sails, repairs and canvas work, and is currently the premier sail loft in North Texas. In 1992 (way before the Internet as we know it today! ), Mariner Sails started our Fly-by-Night direct delivery service for customers who didn't have the support of a local sailing or paddling shop. Just call 800-536-9463 and we'll be happy to help you with your sailing and paddling needs. If you don't live in the Dallas area, we strongly suggest supporting your local dealer. In 1996 we started looking into kayaks, added them to our offerings for 1998, and have expanded our paddling department ever since, offering one of the widest ranges of recreational paddling accessories in the area. In 2007, after many years of being happy roommates, Mariner Sails and Mariner Sailmakers are again one company. We will enjoy bringing the resources of our entire staff in our efforts to service your paddling and sailing needs. Mariner Sails stocks and sells more windsurfing and Hobie Cat equipment than anyone else in North Texas. And our staff members are experienced sailors as well as recreational paddlers, so you tap into well over 100 years of combined "on-the-water" experience with every purchase. We have always been locally owned and operated. We actively support local sailing and paddling events and clubs, and look forward to introducing you to our sailing and paddling community. We also offer lessons. We realize that new participants are the key to the growth of any sport so feel free to ask us anything at all; there are no questions too basic - REALLY! Continuing this year - kayaks and demos during White Rock Lake Clean-ups. Every 2nd Saturday, meet us at the Love of the Lake office in Casa Linda Plaza (Garland Rd. & Buckner Blvd.) between 8 and 8:30am and we'll put you in one of our kayaks to help with a little shoreline clean-up. In keeping with our natural water sport interests we're excited to add paddling to our shop. As with everything we sell, we offer quality paddling products at affordable prices. And of course there are always new things to see with our windsurfing and Hobie Cat products. Exciting wide style windsurfing equipment and teaching techniques make this the best time ever to consider windsurfing. And then there are the new Hobies... the Bravo, Wave, Getaway and the newest Adventure Island and Tandem Island offer performance sailing that's easy and affordable. So stop in or give us a call - we'd love to be a part of your exciting FUTURE. Our staff members are experienced sailors, windsurfers, as well as recreational paddlers, so you tap into well over 100 years of combined "on-the-water" experience with every purchase. Meet Our Staff! !